Given what is happening is Europe, this Henry Payne cartoon seems very appropriate. Speaking of Greek cartoons, this one has generated plenty of laughs. on March 4, 2013 at 4:03 am Question of the Week: Who Is Your Favorite Political Cartoonist? You really need* a picture of Obama at the Temple of Invesco for this. It’s just too good of an albatross not to hang around his neck in connection to this meme. As someone famously said, “The problem with socialism is that you eventually run out of other people’s money”. So the voters of the European welfare states have finally driven the productivity of their most competent citizens in the ground while, at the same time, have perniciously fostered a mentality of living above one’s productivity amongst the masses. Masses who see the ballot box as a giant piñata. But the candy makers are ever less willing to fill the piñatas and there are also ever fewer and fewer people amongst the masses willing to become candy makers (and why should they?). So things are now coming to a head in welfare Europe. Having passed the Event Horizon long time ago European welfare states are now all in line to being absorbed into the black hole of economic oblivion. That is the black hole of a flat competence /reward curve. The march towards prosperity averagdom in Europe is proceeding at slightly different rates amongst different countries due to cultural and geographical differences, but the end result of decline is the same for everyone. One key difference in the rate of decline, is the different shape of the Laffer curve between the sunny Mediterranean and the dreary weather of Hamburg and Helsinki. With nice countryside, sun and beaches you drop out of high value production faster once the masses decide to milk you – hence Laffer curve bends earlier in the Mediterranean. But don’t be too hopeful that Europe is about to teach the world a big lesson – e.g. by going down in a fireball. Not quite yet. The European North still possesses quite a few resources to redistribute to the south before total collapse comes, and the European South is about to get more voting powers over the North’s remaining wealth, as Europeans, in desperation and delusion, predictably turn to more integration suicide and give the South further voting rights over the North’s wallet. The North’s efforts to reform the south into productivity are a delusional hope of desperation. These efforts will be about as successful and painful as US efforts to reform Iraq and Afghanistan into western style democracies. The true European collapse will come when Germans, under the weight of international redistribution – now added to already heavy domestic redistribution — finally start quitting their productive lives. That may still be some way off. Seems like, there are still a few years left of milking the Germans before that happens. But timing when exactly will these distortions be corrected is tricky. One thing is certain: The simple arithmetic of compounding. With anemic 1-2% annual growth, Europe, sooner rather than later, will be absorbed into the worldwide average, probably not in a smooth process but rather as a series of crises separated by relative calm – as is typical of decline. Americans who today look at Europe as a model, or those who, even more foolishly, think that an American Welfare state will somehow perform differently, are today’s useful idiots. But unlike the cold war useful idiots, today’s useful idiots will win in their dream of establishing a low growth declining American empire. More importantly, unlike the cold war days where the pathetic Soviet Union was the only true and hopeless competitor, there are now three billion ascending competitors in BRIC countries; and they are formidable, because they are adopting the once exclusive and efficient American weapon: Capitalism. Michael Lewis summarized the problem by pointing out that Greek railroad workers were getting paid 400 million Euros in salaries while the railroad took in only 100 million Euros in revenue (full quote is at http://positivesumstrategist.com/?p=451). To continue deficit spending, politicians must borrow. How much longer will savers be willing to lend? 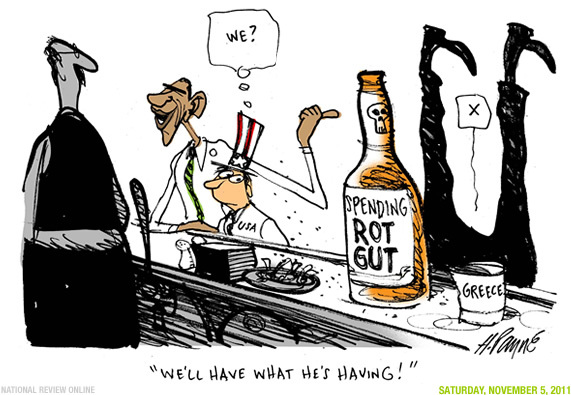 on November 9, 2011 at 12:54 pm Instapundit » Blog Archive » DAN MITCHELL: Obama’s Big Fat Greek Budget Policy….